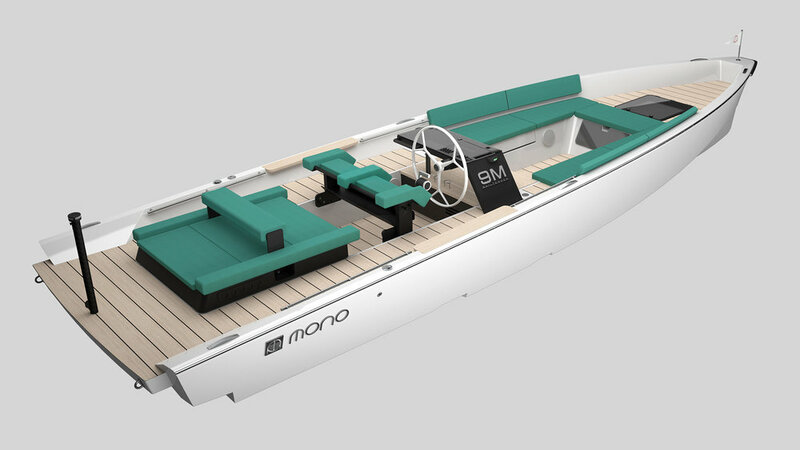 THE MONO 9 TENDER IS A TENDER FOR THE 21ST CENTURY. Merging THE ATTRIBUTES OF AN ADVANCED DAYCRUISER WITH THE FUNCTIONAlity OF A TENDER, powered by a single diesel, Petrol or electric engine. The single-level deck provides ample space for captain and guest comfort while at sea, with dedicated and functional seating both in the front sofa and cockpit area. We believe we have created the perfect setup for relaxing, watersports, diving expeditions and carrying guests and supplies onboard and ashore. The light performance-hull is either powered by a Diesel or Petrol engine for those long range passages or a Torqeedo Electric engine for a smooth and quiet tender mission. The slender vertical forefoot, deep bulwarks and flared bow deliver an effortless ride even in the chop, the topsides have been meticulously shaped to increase carrying capacity without sacrificing the narrow waterline beam needed for agility. Creating a new type of boating experience has required an open minded approach. 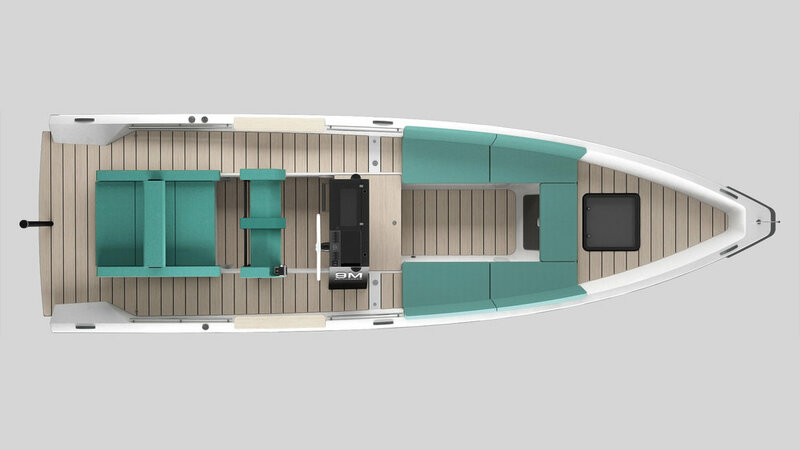 Whether you are using the 9M as a utilitarian tender, beaching it on a secluded beach or staying dry from inclement weather, we have the setup and features to match. A modern helm with all the technical features you would expect is contrasted by a large wheel referencing a sailboat. The spacious front cabin comfortably sleeps 2 adults. Moving the back support in the rear seating area transforms the sofa into a double sun bed. The bimini top mounts easily when you anchor up and want a break from the sun. Constructed from Grade A Carbon and Dacron fabric. Sturdy wood dining table mounts effortlessly in the front. Stay dry from the rain or just protect yourself from a brisk breeze. The spray hood mounts quickly and sits 4 passengers comfortably. 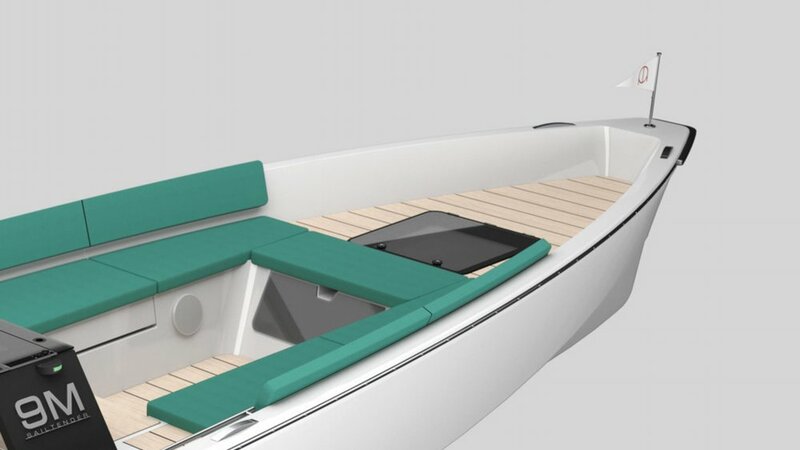 Our hulls are built using high quality vacuum-infused – fibre reinforced – Vinylester composites, combined with a sandwich construction of Divinycell™ core materials. This combination optimizes strength, weight and performance. We finish the boat with only customized or select quality components, all the way down to the last bolt. With 25 years of experience developing the most efficent stepped-hulls on the market we can ensure state of the art handling and performance. With minimal planing threshold and a low centre of gravity, the 9-Series performs equally well at high and low speed. The remarkable stability ensures safety both when driving and at rest. The result of our advanced construction process and choice in materials has a direct impact on the environment. Our efficiency, light weight hulls result in low energy consumption, whilst vacuum-infused production methods provides 100% control of materials and minimal waste. The high efficiency is what makes our concepts very suited for electric propulsion. Click below for complete pricelist and specfication for DIESEL & PETROL options. Click below for complete pricelist and specfication for ELECTRIC options.